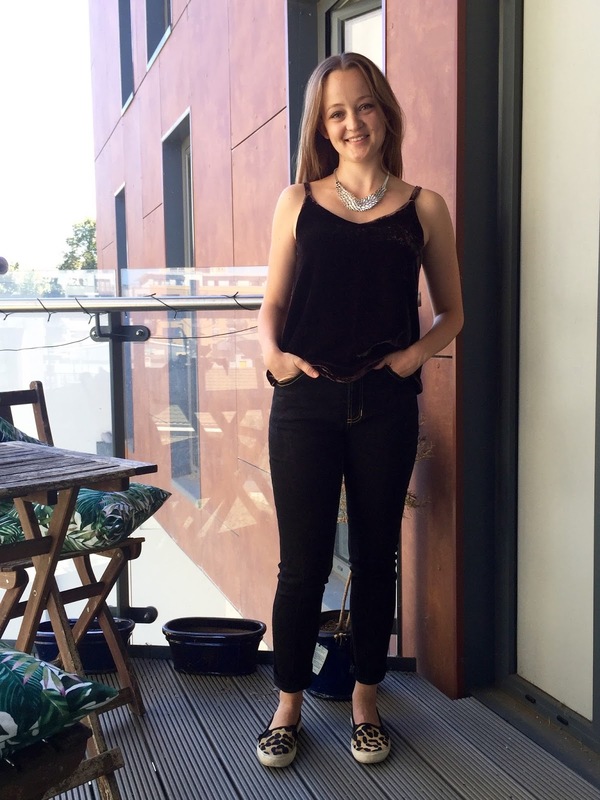 London has been clinging on to summer and I have been clinging on to my handmade summer wardrobe but with this month’s project for the Mood Sewing Network I have finally taken the plunge and started some projects more suited to the approaching season. Sewing my own jeans has been in my sewing queue for nigh on two years now and I am almost ashamed to admit that I actually cut these Ginger Jeans out well over a year ago. It is by far the longest a project has taken me from putting scissors to cloth and completion and I’m not really sure why as once I started sewing I had them finished within a matter of days. 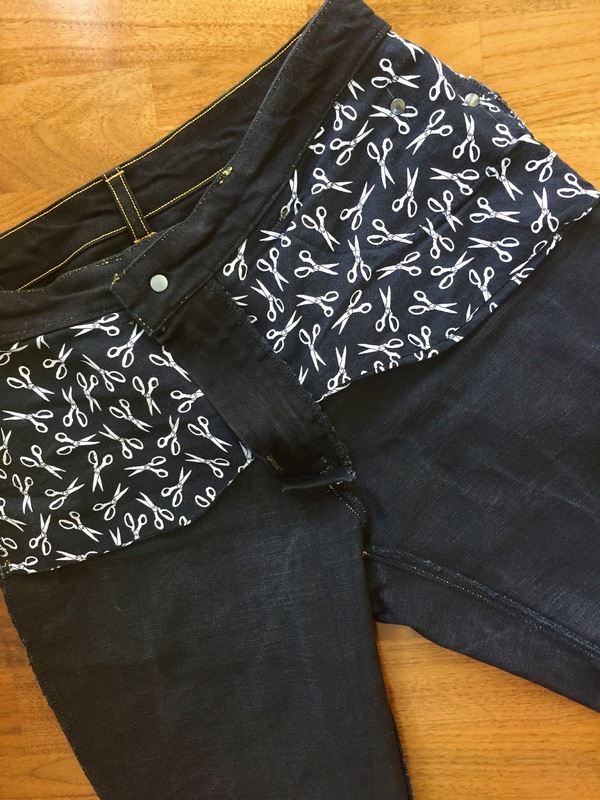 Despite the amazing looking jeans popping up on sewing blogs all over the internet something about the task really daunted me and I kept telling myself there was no point starting such a massive challenge until I had a good chunk of sewing time carved out to focus on the task at hand. How wrong was I. Jeans making is the perfect thing to take one little step at a time. I’m a dark denim kind of girl (although after sewing these I’ve become mildly obsessed with looking at denim and have been tempted by all sorts) and was for some reason drawn to this particular Marc Jacobs Stretch Cotton Denim online. Something about the description just said to me that it would be the right choice of this garment. Miraculously as I ordered this so long ago the same fabric is still in stock but if dark denim isn’t your bag or you’re after something a little more interesting the Mood Fabrics website has a consistently pretty spectacular collection of denim on offer in all different weights, colours and even prints. This one has a lovely deep colour which comes across as almost black in the pictures but in reality is a dark dark indigo blue. It was quite stiff to begin with but is now washing up an absolute dream. After a few weeks in rotation it is starting to develop that lovely worn quality I really like in denim. 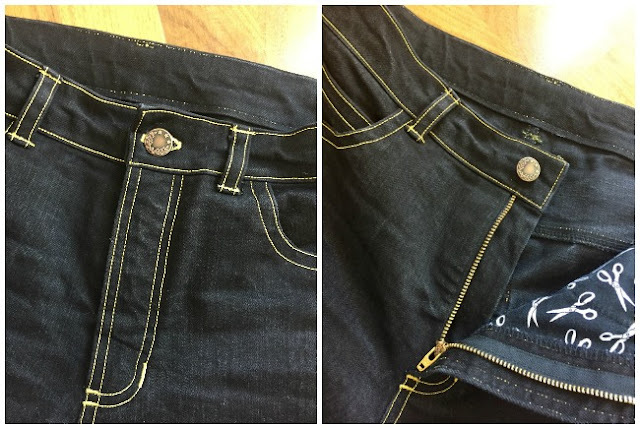 It can be quite hard to judge the exact colour weight and texture of a traditional denim when buying online but the bonus is there are detailed description including fabric content so you can see how the stretch will work for your pattern with no guesswork involved. 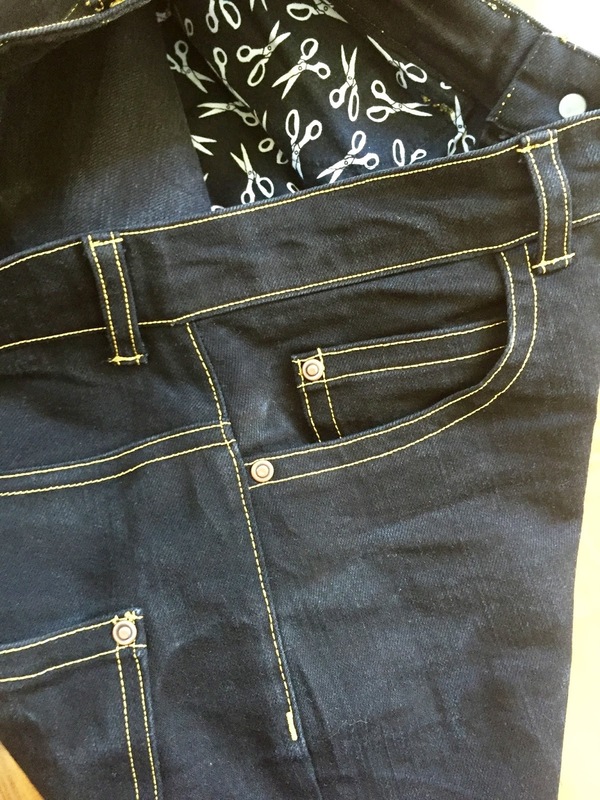 For my first jeans making attempt I was tempted to pick something super cheap and cheerful but i’m glad I picked a good quality denim as it made the whole sewing process so much more enjoyable. I’m a big advocate for investing in good quality materials when and where you can as it can benefit your finished garment in so many ways. Not only did it give me a more accurate idea of how this pattern works on my body than a mega cheap muslin using a decent fabric makes me so much more careful and more determined to get things right rather than let the mistakes slide by without correction. Plus working with better quality fabric generally makes the sewing process easier as it will handle and press better. 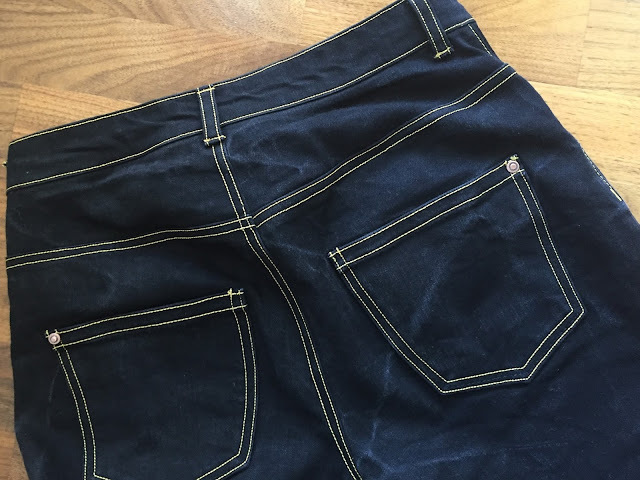 This cut, pressed and sewed really well without fraying terribly and it’s the perfect weight for jeans of this sort. Nice and tough without being too restrictive or stiff. Fit wise I’m pretty delighted for my first try. This is view B with the high rise and skinny legs. I cut the size 6 and luckily am pretty much the same size as I was a million years ago when I cut them out! I am so comfortable in them all day long and have absolutely loved wearing them. I have got some wrinkling under the bum but now I’ve worn them for a bit I don’t think I’m going to try and change this as the amount of excess fabric in this area is good for movement and sitting down. I’ve also got some wrinkling behind the knees which is quite common with slim trousers on me and bothers me more. From a bit of research I think I need to do a slight full calf adjustment to stop the fabric bunching up in this area. They are slightly wider at the ankle than I would usually like but I think this is due to the fact that I shortened them by 4″ at the hemming stage. Now I know how long I want them I’d shorten them in a couple of places up the leg rather than taking this much of a chunk from the hem as I think I lost some of the slimming at the ankle in this. I have been wearing them a bit with the hems turned up as I quite like that look with this width of leg. I do absolutely love where the waistband sits and the way it hugs the body. I’m not sure I have got my pocket placement quiet right, what do you guys think? 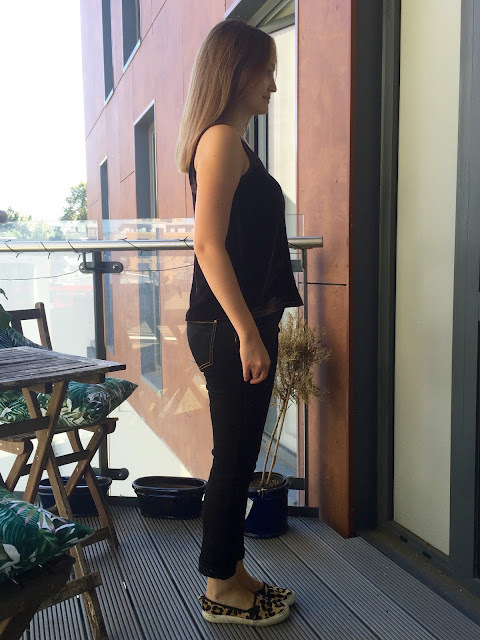 Any thoughts and advice on fit would be much appreciated as I am a trouser sewing newbie and am not yet entirely sure what to look for. I’ve tried to lighten the pictures a bit so you can see better as I know the dark denim conceals a lot! As for the construction I followed the sew-along rather than the instructions that came with the pattern. 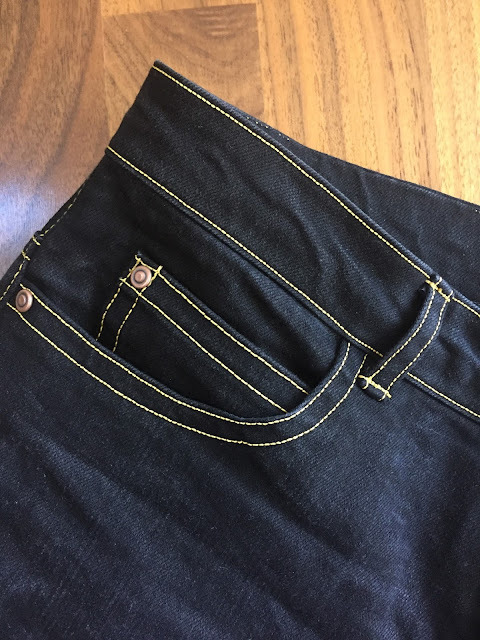 I would highly recommend this sew-along to anyone who is new to sewing jeans or anyone who wants to improve their jeans making. I went in one side a complete novice and came out of the other feeling like I had really learnt something and that I also understood what I had done and why rather than just blindly following along. I’m definitely going to be referring back to Heather Lou’s posts in future, no matter what pattern I am following. I was absolutely dreading inserting the fly but before I knew it it was done and I was really chuffed with the results. The pockets of the other hand I am absolutely chuffed to bits with. I loved that these are pretty much the first thing you do so you get to feel excited about the fact that you are actually MAKING JEANS pretty much straight away. I did the pocket stay that stretches all the way across to the fly rather than the separate little pocket bags. 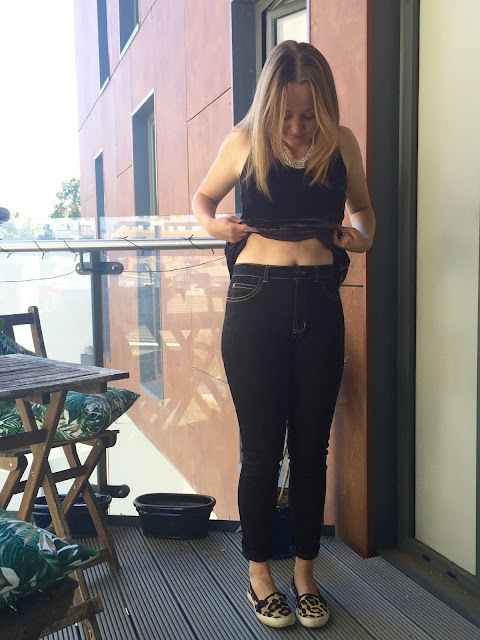 I’ll absolutely be doing this again as it feels so nice to wear as it keeps a nice shape across your stomach without being uncomfortable. The current PDF version of the pattern includes the pocket stay with this view but as I was using a (very) old copy I followed Heather Lou’s instructions in the sew-along to draft my own. The interior pocket fabric came from a stash of quitting cotton scraps and fat quarters that I have squirrelled away. Pockets are the perfect thing to use these for! I wasn’t planning on adding rivets as it was my very first pair and I was thinking it was best to take things one step at a time. But by the time the fly went in and I was looking at an assembled front I knew I wanted to go the whole hog! I usually rely on my good old vario pliers to insert snaps, no sew buttons and such like but because the rivets aren’t at the edge of the garment the pliers won’t reach. Instead I remembered I had this strange and untouched tripod tool hidden away at the bottom of my box which (once I’d figured out how to use it) was pretty great. The same pieces that hold either end of the rivet in the pliers fit into this tool and it works in pretty much the same way except that the two parts are separate so you can use them anywhere on your garment. Line them up, give it a few strong whacks with the hammer and voila. Who said sewing was a peaceful hobby?! I didn’t use the punch that comes with the kit to make the holes for the rivets as I find they come out worryingly large and I think the rivet will sink through the hole with time. Instead I poked a small hole through with an awl that was just about big enough to squeeze the base of the rivet through. 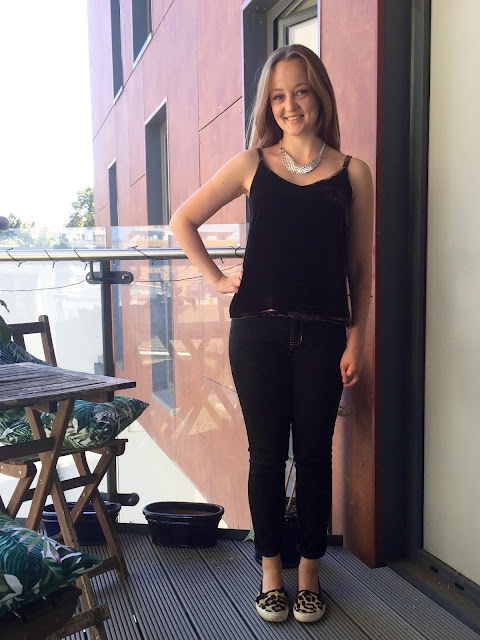 To pair with my jeans I wanted a sleek and simple top which might dress them up a little. I am always disappointed when the warm weather and sunshine depart but one failsafe way to cheer myself up is to embrace the trends for the next season and get to grips with my autumn/winter sewing plans. One idea that’s really grabbed my attention this year is using velvet for more casual garments when it is traditionally viewed as a fabric more suited to evening/special occasion wear. I love the thought of mixing in a different texture in small areas of an outfit and the rich tones and plush nature of velvet seem to suit the season so well. I chose this Fudge Soft Rayon-Silk Velvet from the new arrivals page as the description sounds so luxurious and I was drawn to the warm, neutral tone despite the other lovely colours in the range. I like a slinky drapey velvet which is exactly what this is thanks to the viscose content. I paired it with the True Bias Ogden Cami pattern which I’ll review in more detail in another post soon as this was actually my second version of the top. The fact that I’ve already made two kind of speaks for itself! To give you a brief rundown I cut the size 4 and took 1.75″ off the length of the straps to get it to sit comfortably. Instead of using the half lining pattern pieces I chose to fully line this version as I thought the silk satin I discovered in my stash would be nicer against the skin than the back of the velvet. I’m pleased that I thought outside the box a little with the fabric choice for this pattern. The simple style is a great way to showcase a special or interesting fabric and it’s pretty quick to construct so is nice to give yourself the challenge of working with something trickier to handle. And while I’m on the subject of tricky to handle this slippery little gem sure is that! it took real concentration to get this cut on grain but it did sew up surprisingly easily with the use of plenty of pins and a microtex needle. 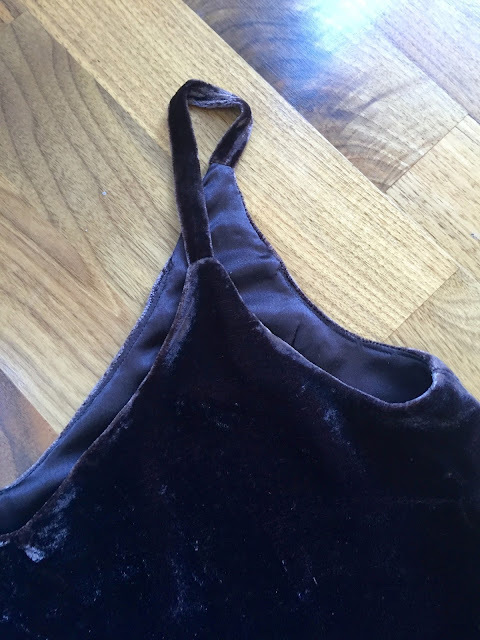 I did think that perhaps the little straps wouldn’t work out great in the velvet and I almost opted to use the silk lining for them instead as that might have been a cute contrast but I gave the velvet a whirl and am delighted with how they turned out. The pile of the velvet was slightly damaged from travelling all the way across the Atlantic in a box with a number of other less delicate yardages but it had a pleasing semi crushed finish which I went right along with and was a little heavy with my handling of it throughout. I think the slightly worn effect really works with the idea of using it for a casual garment to pair with jeans. I’m also looking forward to pairing this with a simple skirt and heels for a night out. Now that my handmade wardrobe includes jeans I’m definitely going to be wearing home sewn almost every day. 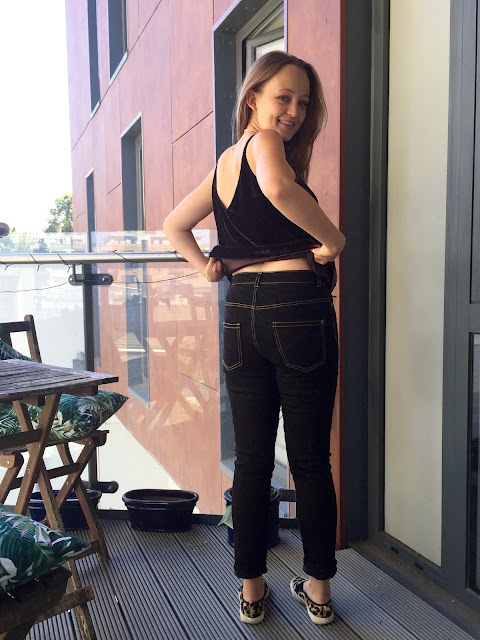 All in all being able to say ‘thanks I made them’ when a friend at work said ‘they’re nice jeans Fi, where are they from?’ was one of the best feelings I’ve had since I started sewing!